The symbol manager is a comprehensive system for managing symbols and the libraries that store them. To open the symbol library manager, select menu File > Symbol Manager.... The dialog shown below will be displayed. Note that the box can be resized in the usual way. 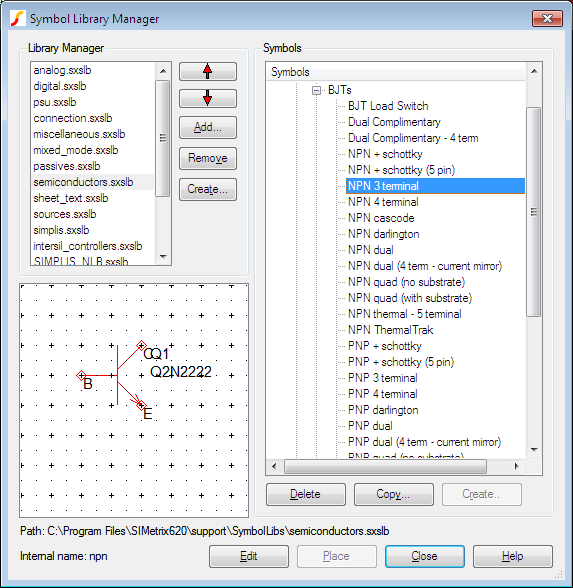 The symbols available to the schematic editor are stored in library files which conventionally have the extension .SXSLB . Only symbols in installed libraries are available for placing a new part. Note, however, that once a symbol is placed on a schematic a copy is stored locally, so you can still view a schematic that uses symbols that are not installed. The symbols in each file are grouped into categories using a tree structure as shown above in the Symbols box. The manager allows you to install or uninstall library files, to move symbols between files or categories, to delete symbols, to copy symbols and to create new categories. You can also create new empty symbols ready for editing with the symbol editor. Select the Add... button and select a library file to install. Clicking the Add... button will open a file select dialog box allowing you to add a new symbol library file. Select the library file you wish to uninstall from the Library Files box then click the Remove button. Note that this does not delete the file. When searching for a particular symbol, the library files are searched in the order in which they are listed in the Library Files box. To change the order, use the Up and Down buttons. To move an individual symbol to a new category, simply pick it up with the mouse and drop it onto the new category. You can move a symbol to a new library by dropping the symbol onto a library file in the Library Files box. You can move more than one symbol at a time by picking up a complete category. To copy a symbol within a library, select the symbol in the Symbols box then click the Copy... button or use the right click menu Copy Symbol.... Enter a new user name for the symbol. It isn't usually necessary to change the internal name. To copy symbols to a new library, use the same drag and drop procedure as for moving but hold the control key down while doing so. You can do this for a single symbol or for an entire category. Note that when copying to a new library, the symbol retains its user name and internal name. There will therefore be duplicates installed unless they are renamed. To delete a symbol, select it then press Delete or the right click pop-up menu of the same name. You can also delete an entire category in the same way. Select a symbol then press F2 or the right click popup menu Rename. You can also rename a category in the same way. Note that this only renames the user name of the symbol. There is no method of changing the internal name other than making a copy with a new name, then deleting the original. To create a new category, select the parent category where you wish it to be placed, then click Create... or the popup menu of the same name. In the dialog that opens, select the Category button and enter the new name. Select the category where you wish the symbol to be placed, then click Create... or the popup menu of the same name. Enter the desired user name. An internal name will be automatically entered as you type in the user name. This can usually be left alone. The symbol created will be empty. Use the symbol editor to define it. You can call this directly by clicking the Edit button. Note that this will close the library manager dialog box. If a schematic sheet is open, you can place a symbol on it directly from the library manager by clicking the Place button. Note that this will close the dialog box. The system symbol libraries are listed in the file SystemLib.sxlst located in the symbol libraries folder. The libraries are treated specially when written to - e.g. when editing any symbol in the library. System symbol libraries are protected from being edited directly. You can still edit the system symbols, but the changes are stored separately in an ASCII file located in a directory in the application data area. This scheme protects such changes from being lost when the system symbol libraries are updated during a service update. The system symbol libraries are stored in a directory defined by the SymbolsDir option variable (see List of Options). This is typically located at C:\ Program Files\ SIMetrixXX\ support\ symbollibs. The directory where system library edits are stored is defined by the UserSystemSymbolDir option variable (see List of Options).